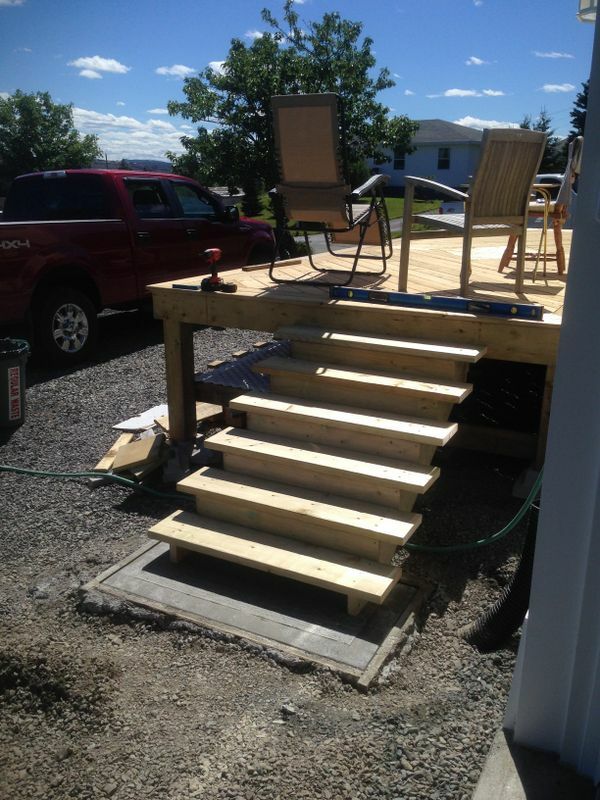 August 2016: The old Front Patio on my Dad's house in Bay Roberts had seen better days and was finally torn down earlier this year. 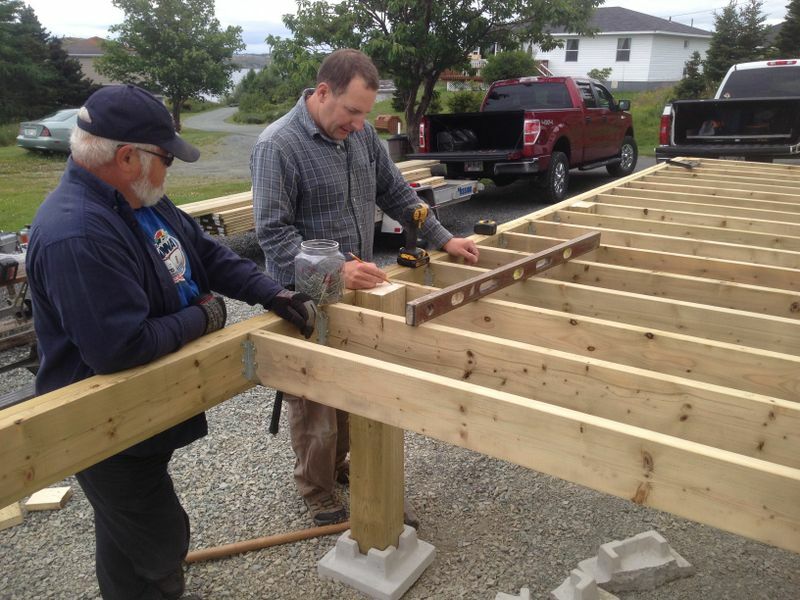 In July Bassan and I headed out to lend a hand framing up the new deck. We started by finishing the 3/4" Pour Form skirting board around the house which was painted grey for a clean appearance. 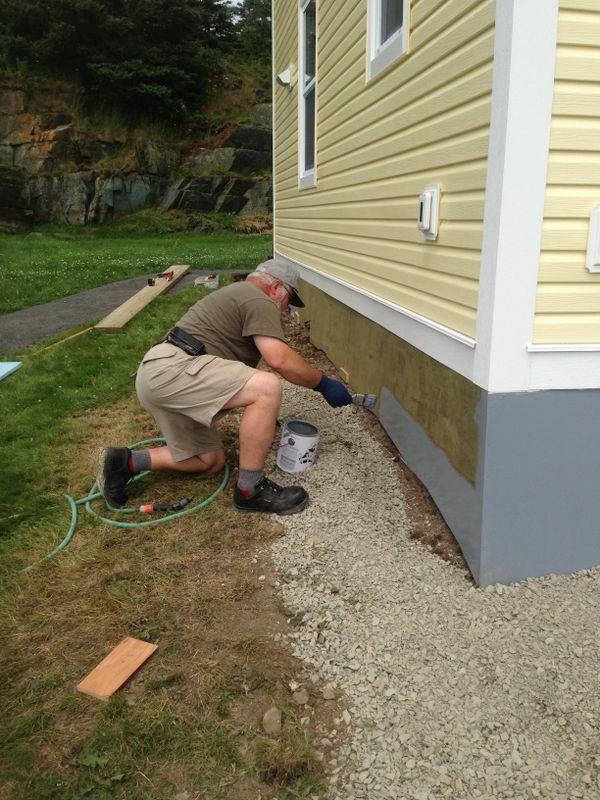 This was the last step in outside repairs after just having new siding, vinyl trim and windows installed. 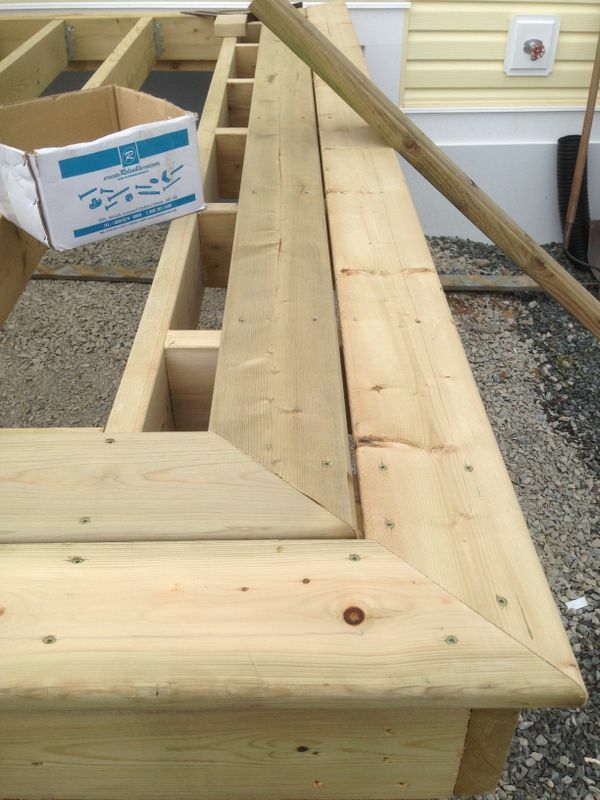 We used 6x6" posts and notched them to hold the 2x6 frame. 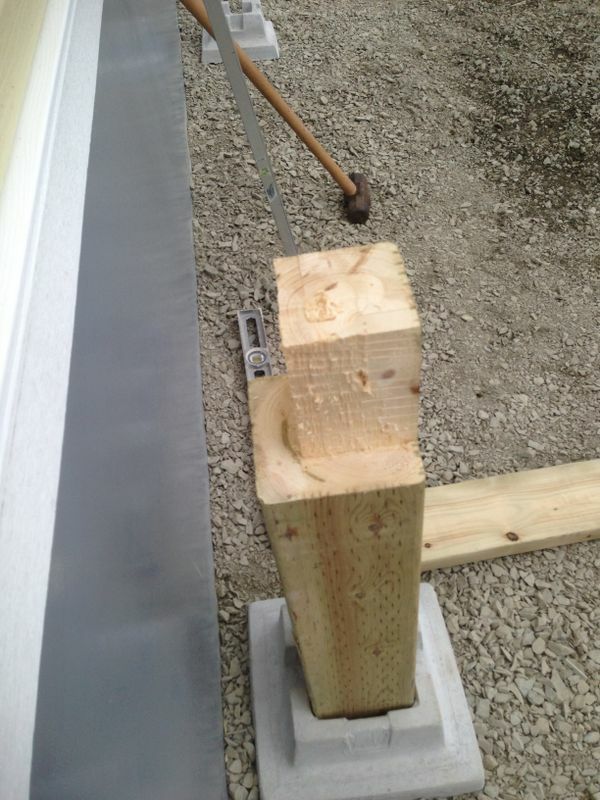 This provides a very strong secure joint that will last long into the future. 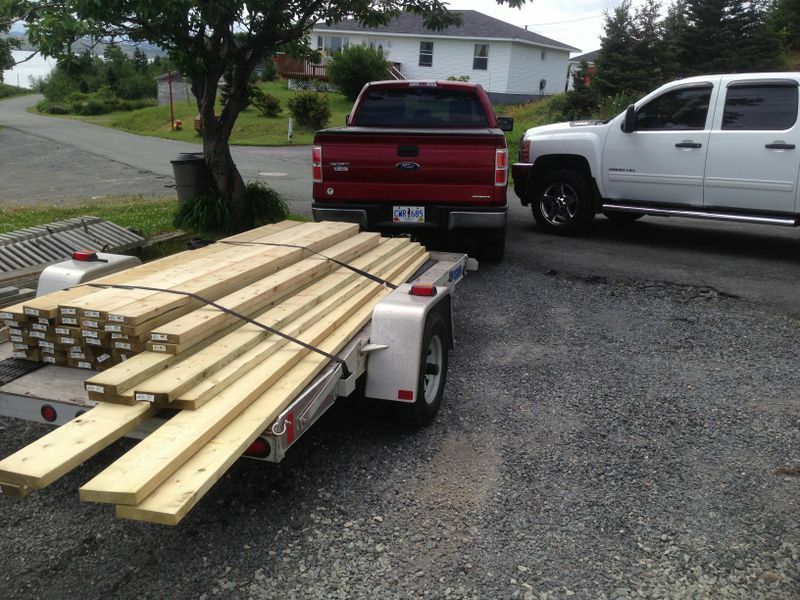 All cuts were treated with clear wood preservative. Most of the frame complete. 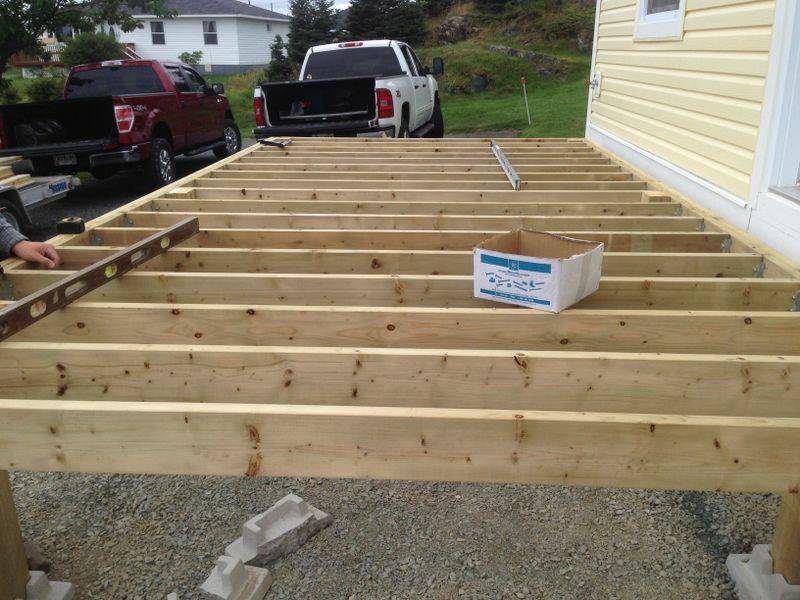 The perimeter joists were doubled up with a 2x8, the stringers attached with joist hangers and set on 12" centres to support deck boards which were to be installed on a 45 degree angle. 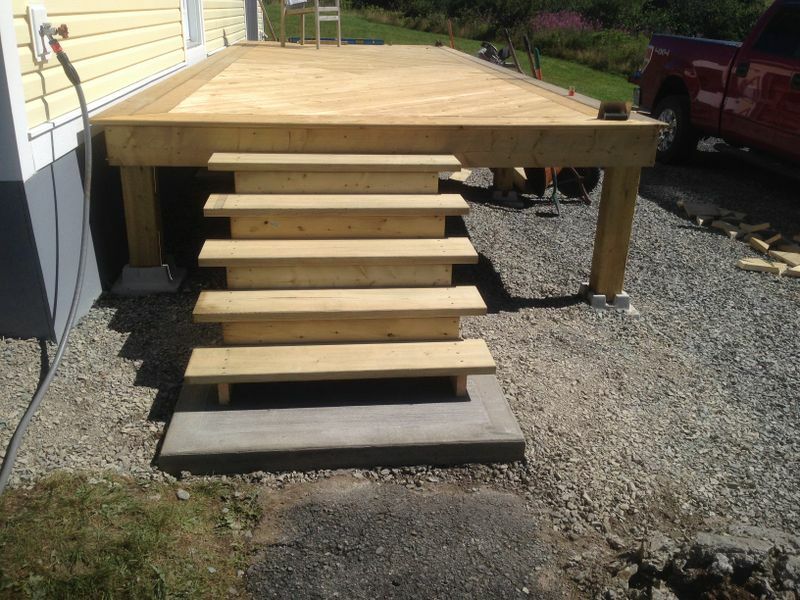 On the next trip to Bay Roberts we began the deck surface which was completed using 5/4 pressure treaded deck boards. 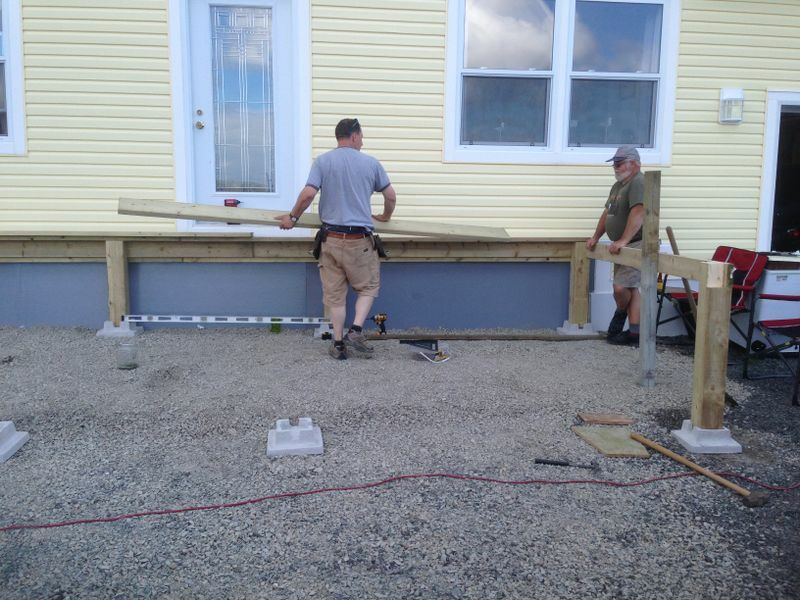 Dad wanted a double outside boarder so we had to install a lot of blocking to properly support the decking. 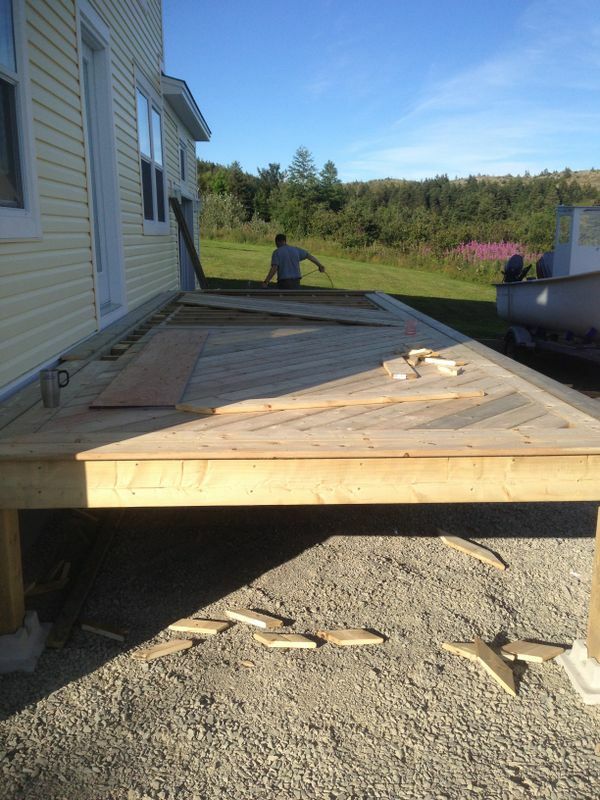 The deck boards were ran on a 45 degree angle in two different directions meeting on a straight centre board. 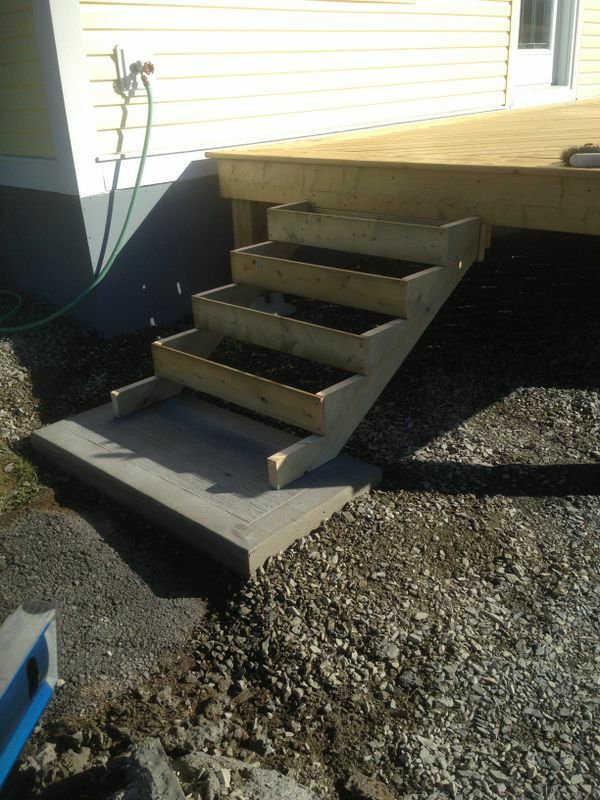 The last trip around the bay was an overnighter for me and we completed two sets of stairs, one at each end of the deck. 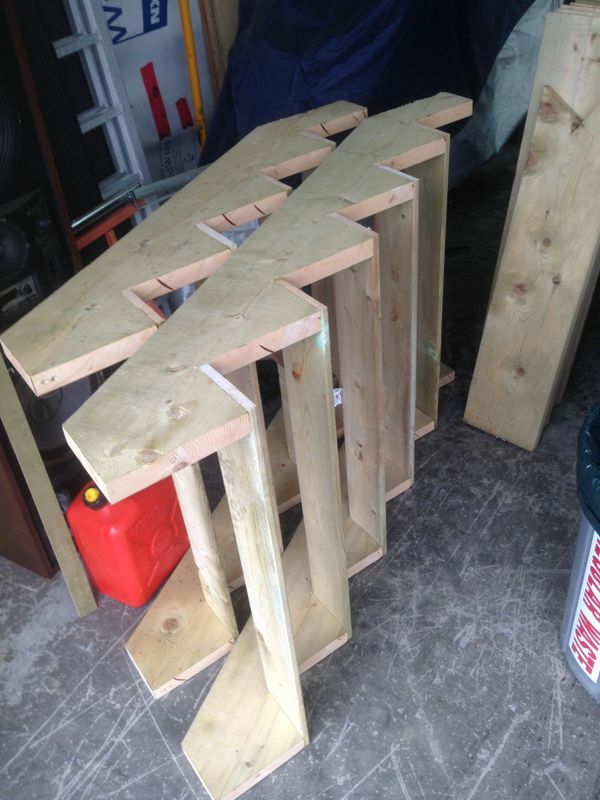 Dad wanted a low rise so he will find them easier to climb. 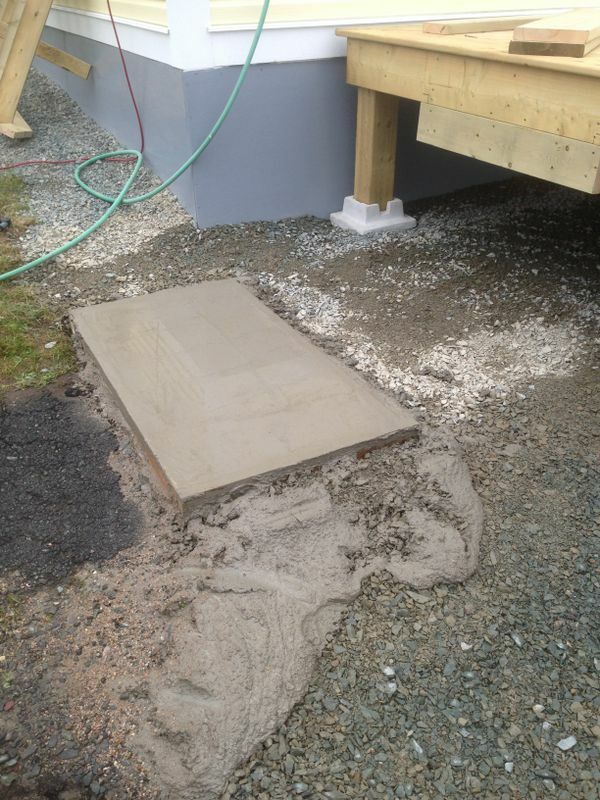 We hand mixed 5 bags of Quickcrete for each of the two pads that will properly support the stairs and create the final step. I finished the pad with a brushed surface and an edger for a tidy appearance. 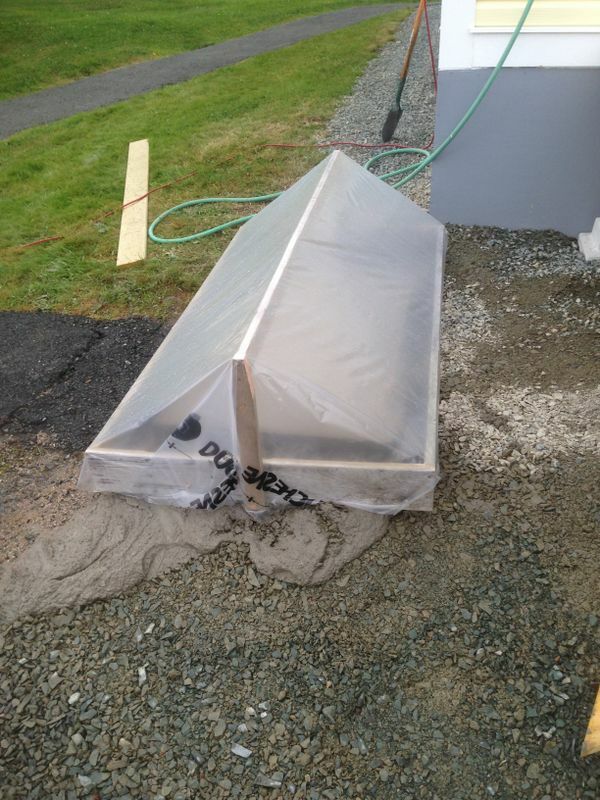 With rain in the forecast Dad built a cover to prevent the concrete from getting wet while curing overnight. 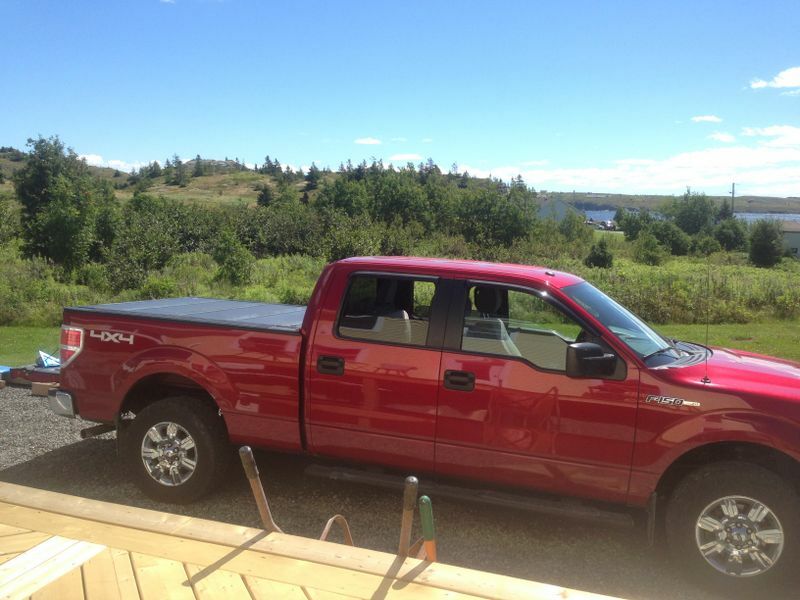 The bottom step appears low but wont be once the tread is installed. 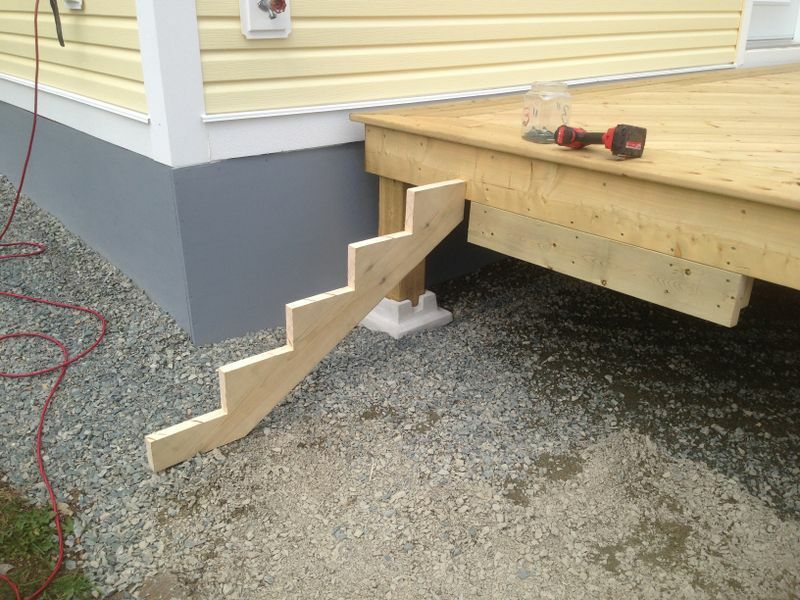 Steps complete. 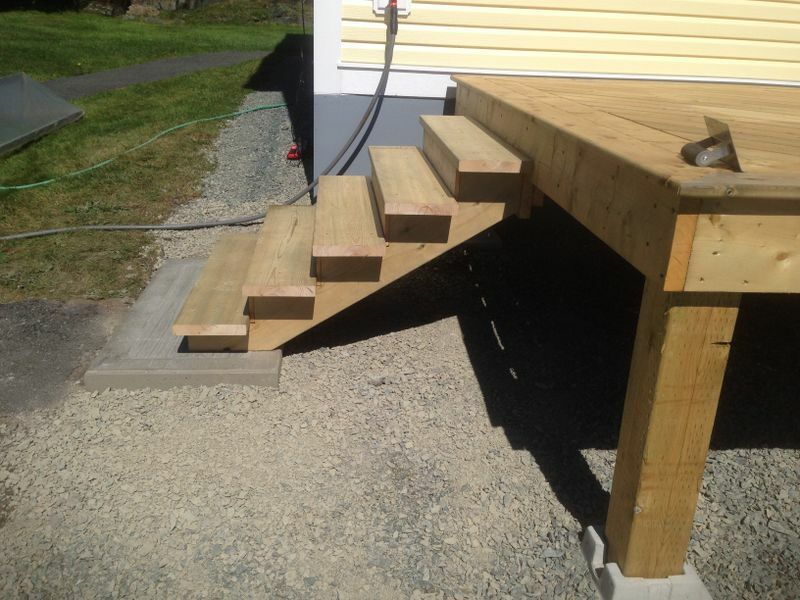 I used pressure treated fence paling as a backer board and every step from the deck surface to the concrete landing has the exact same 5" rise which is very important to prevent tripping. 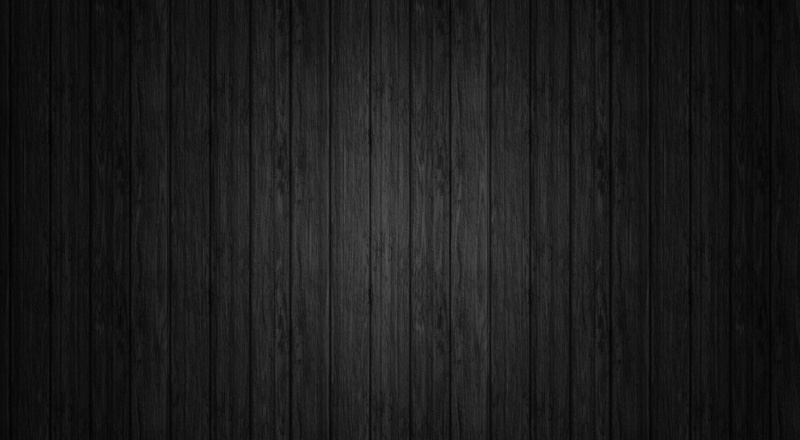 The finished (for now) deck. 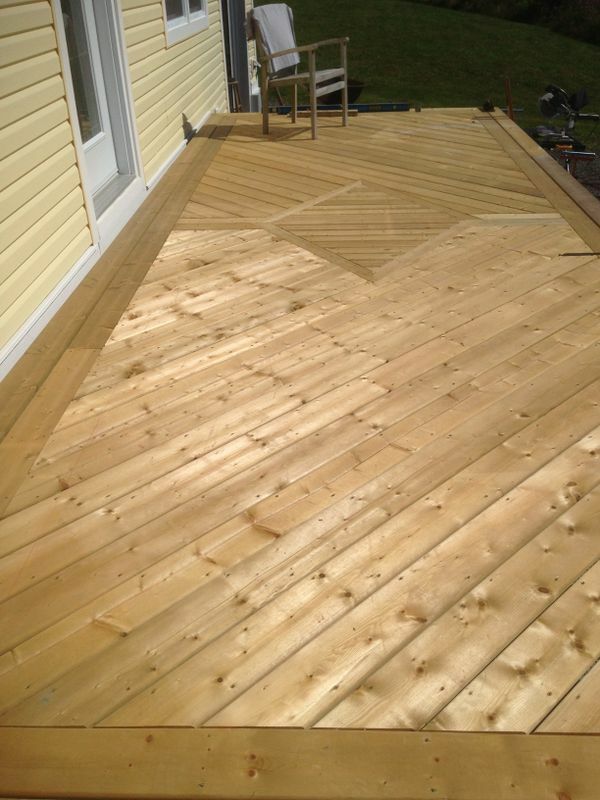 Dad and his good friend John cut out and laid in a custom diamond pattern in the centre to accent the deck design. The only thing left will be railings which will most likely be an aluminum product. 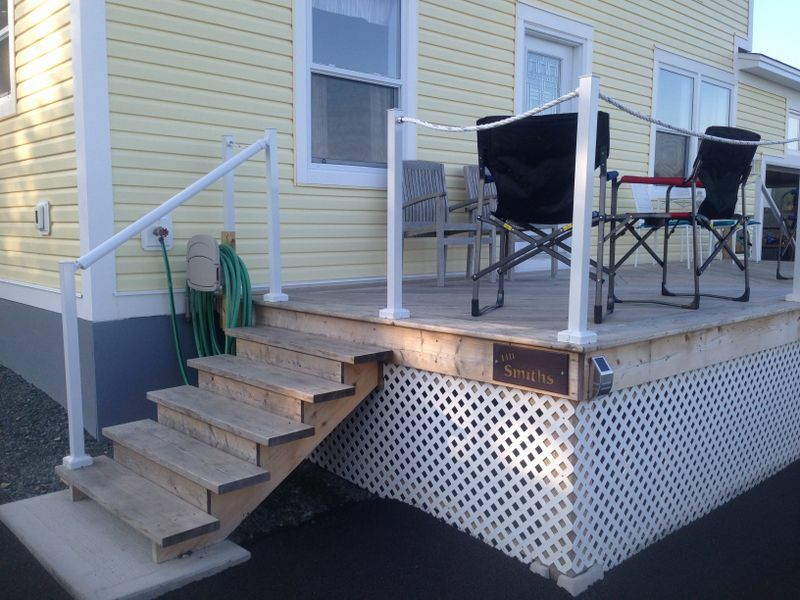 Summer 2017: Dad finally got around to finishing his front deck. 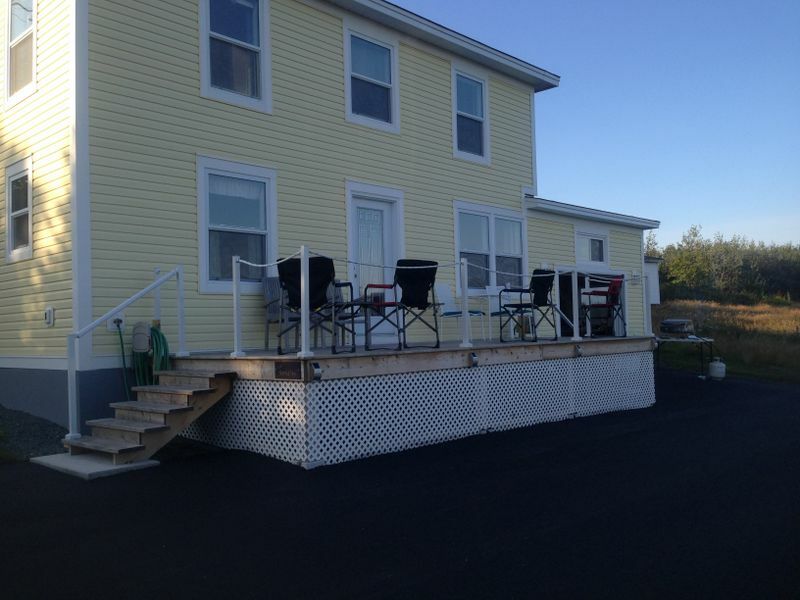 Over the summer he installed framework to support white vinyl lattice to close in the bottom of the deck and install his aluminum/rope railing to fit the nautical theme he wanted. 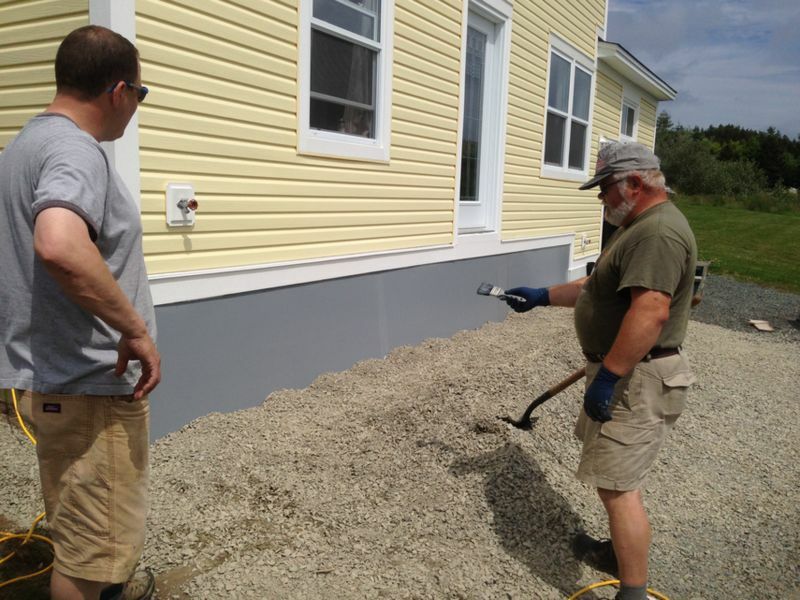 The last step was completing a new paved driveway around the house over to the garage.